A hybrid cold/bubonic plague bug hit me last week. While sitting at home and throwing back doses of NyQuil, I had a chance to try out a preview of the upcoming Windows 8. Microsoft released a “preview” version through its testing channels to get some feedback on its progress. We’re in for some big changes — mostly good ones from what I could see, and a few annoyances to make things interesting. It seems Steve Balmer finally decided to get rid of the Windows 95 coding team and get some fresh talent as this new version is showing off something you don’t normally associate with Microsoft: polish. Windows Vista, Google, and Apple all smacked some sense into the Redmond headquarters over the last few years. They managed to prove people don’t want a bulky and overloaded operating system. Consumers want an OS that starts instantly, navigates quickly, and shows relevant information. Windows 8 is the fruit of these hard-taught lessons, and has the potential to bring Microsoft back into the limelight. The new tiled interface really grabs your attention. At first glance, you think “What is this??? It looks like something made by Playskool.” Microsoft realizes the days of the standard PC are numbered, so they want Windows to run on everything…a universal operating system in a sense. That means tablets and phones are a high priority. Windows Phone 7 was a test bed for the ideas in Windows 8, and you can see the similarities. The bright colors and large tiles are meant to facilitate both mouse use and touch screens. What makes these tiles unique is they’re not just large, square buttons — each tile is its own little monitor that shows the status and updates of the app behind it. This active icon environment makes using Windows 8 very efficient as you can see a lot of information with a single glance, much the same way you can glance at your phone and see if you have new email, the time, temperature, new voicemail, etc. Most of us use passwords to lock our computers, so we’re very familiar with typing in a password each time we need to log in. 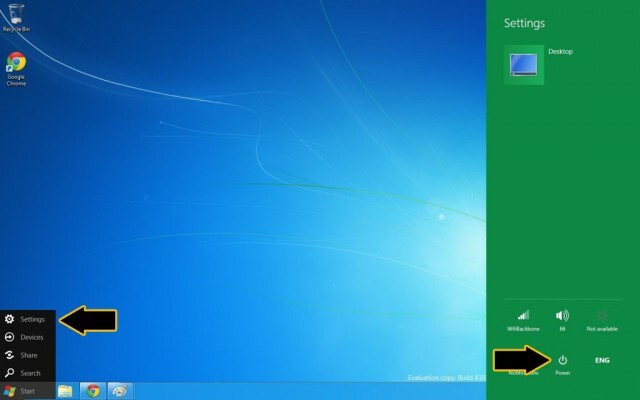 Windows 8 wants to get away from text based passwords. To unlock your Windows 8 profile, you can set a series of taps or swipes on a picture to let you in. For instance, in the picture below, you can set your “password gesture” to be a tap on the mountain in the upper left corner, a left swipe across the water, and a circle around the glass. 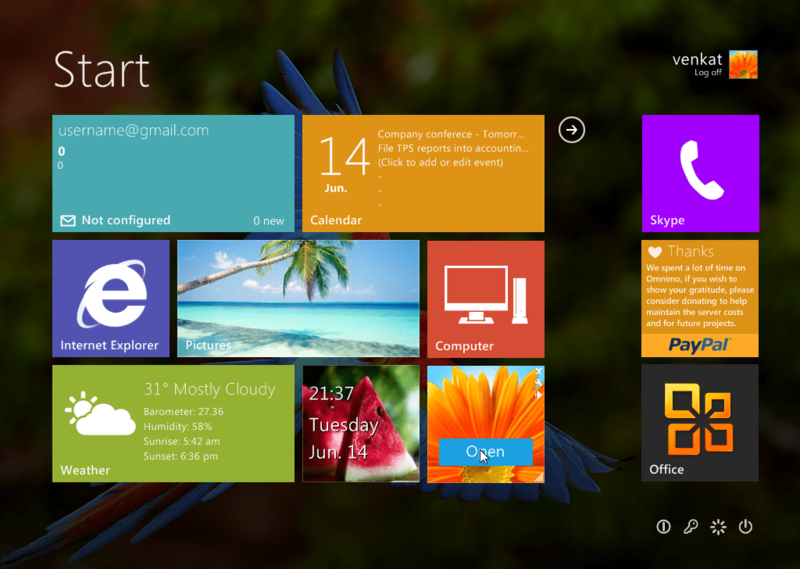 Windows 8 has a standard “Windows 7-like” desktop option, but all the action is on its new default Metro Start Screen. Easy-to-read and informational tiles replace icons and the Start menu, meaning you can see everything you need to know in one look. The more I used the Metro interface, the more I liked it. Those familiar with the XBox 360 will feel at home as it has a similar feel. It’s definitely designed for tablet use, but seems to work fine on a computer. This is one of those things that I urge people to try before judging. With the Metro Interface, you can use Groups instead of folders to organize your apps and files. Media, games, social networking, work…make a group and add your apps to the pile. This makes it easy to find what you need without having to dig. I hate restarting my laptop. It takes forever. It can take so long that a lot of people schedule their bathroom breaks around reboots. Reboots are a lot like commercials during a football game. Well, the old “I’m rebooting my computer” excuse has now been thrown out the window. 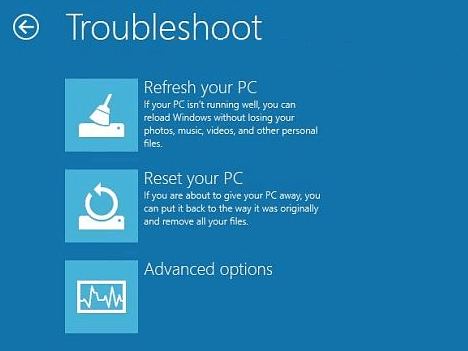 Windows 8 can restart in 8 seconds. Eight Seconds. My phone takes longer to start than that. Microsoft explained they’re using some new kernel sleep technology so the core parts of Windows never actually shut down, therefore it’s always ready to go at a moment’s notice. Microsoft caters to the social networking crowd by adding in some really nice streaming tools. The Windows 8 “at a glance” mantra follows through here as you can see updates from multiple services at one time. Windows 8 takes a different approach to multitasking. Instead of resizable windows, each app carves out its own nook on the screen so it can be viewed in conjunction with others. The example below shows how you can watch a video and keep up with a newsfeed from your friends at the same time. Most news sites have an RSS feed to give you instant updates and quick information. Previously you had to have your own browser-based tool to view these. RSS capability is now native in Windows 8. All of your favorite sites can now be previewed on one screen as soon as your computer powers up. The new Control Panel has a button called System Refresh, which essentially reinstalls Window 8, but leaves all of your documents, music, photos, and other files in place. Other things they’ve finally added are universal spell check (not sure what the hold up on that was), universal zoom (allows you to magnify/shrink the screen with the mouse wheel or a pinching motion), and an easy Share feature that lets you share media and web items with your social media friends via drag and drop. All of this, and it runs on half the memory of Windows 7. How ’bout that! Some ideas are great, others not so much. It may be due to being an unfinished product, but there were some glaring flaws in Windows 8 that need to be addressed. We’re all used to clicking the red “X” when we’re done using something in Windows 7. Well, the Windows 8 people decided that closing apps is too much work, so now the only way to end something you’re running is through the Task Manager. The Android operating system actually runs in a similar way (apps are supposed to close automatically when resources are needed), but I frequently have to use an app killer program to keep my phone from bogging down. The Task Manager is Windows “App Killer,” but it’s very inconvenient to reach. OS app management sounds good on paper, but in the real world users need to be in charge of their resources. We’re approaching our second decade of the iconic Start menu in Windows, and in Windows 8 its roll is clearly being diminished. In fact, by default there IS no Start menu — the new Metro interface shows you a “Start Screen” instead. You have to retool your thinking about organizing your files and apps. This will result in a large learning curve for the average user. It is possible to add the Windows 7 taskbar to the bottom of the screen…but it only works with legacy 32-bit programs. New Windows 8 apps will not use the taskbar. Seems like this will cause a lot of fragmentation. We all know how to shut down Windows: you click the Start button and click the “Power” icon on the bottom of the menu. Windows 8 seems like it doesn’t want you to shut it down…ever. You have to go through 4 to 5 clicks to power down Windows 8, with icons on opposite sides of the screen. It actually took me a while to figure out how to shut it down. Hopefully the Power Button Design Team simply didn’t get its project done in time for the preview and this will be adjusted in the final release. 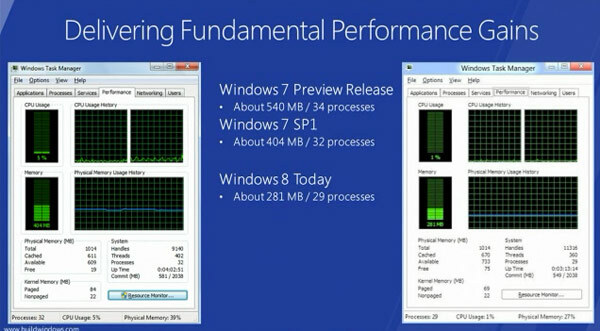 Windows 8 is going to be a turning point for Windows. It’s new interface is slick, it’s code is tight, and it’s vision is contemporary. I have been researching buying a new computer with WIndows 7. We have three computer with WIndows XP, and one with Vista. They work find but I feel like some things don’t work, since I don’t have Windows 7. When will Windows 8 come out? The current goal is a release in mid-late 2012, so we have at least a year to think things over. My company stopped using Winblows years ago – we got tired of throwing money at microsoft! Frugalware Linux on the other hand is fast, secure, rock solid, and last but not least it’s free! I’ve been using FreeBSD and Debian Linux for 6 years now; I’ll never go back to Windblows! Thank God for Linux! 1) There’s so many versions and flavors, it’s not easy to support. 2) Hardware support is lacking. 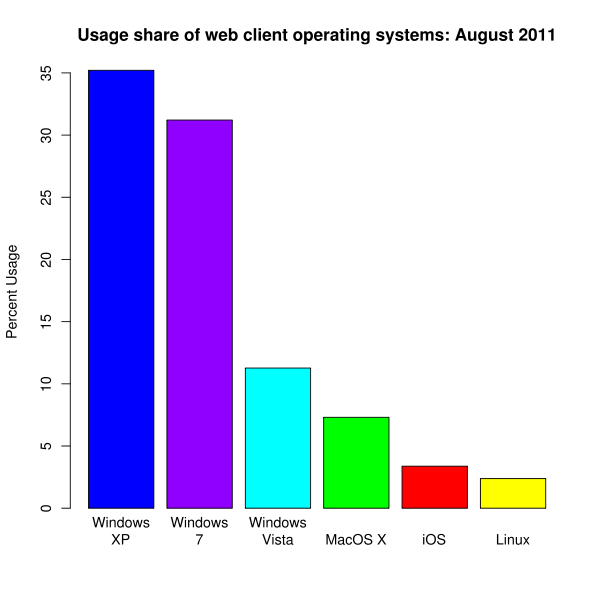 3) While you save money on initial operating system costs, you typically spend more on making other systems compatible. Now, with cloud computing, this is becoming less of an issue since all you need is a working web browser. Microsoft is clearly targeting the iPad and Android markets with Windows 8. It will be interesting to see what becomes of it. What is Doug smoking? Obviously he seriously lacks knowledge of the Linux distributions! Linux has caught on like wild fire – the general public and especially businesses have been merging to Linux for years! I realize people tend to be passionate about their operating systems (the “I use it so it’s the right thing to do for everyone!” syndrome), but I am actually working in the current industry, and Linux doesn’t even show up on the radar on the workstation level as a whole. If anything is going to start a fight for workstation space in the coming years, it will most likely be some flavor of Google OS, but even that is just a guess. That’s pretty funny. As a senior software engineer for my company, we’ve seen a huge merge to the Linux OS for business workstations. The overall cost savings, performance, reliability, security, efficiency…have lead to this merge. As for the general public, Linux might not show up “as a whole” because their too busy playing with their cell phones, iPods, and other silly toys. It’s not a case about being passionate, it’s a case about facts! The Windblows OS is just an inferior product! (For the reasons listed above.) Want to make an enhancement to the Linux kernel, no problem. Want to make an enhancement to the Windblows OS, you’re SOL! And let’s not even get into the microsoft licensing nightmares! I can have my favorites bar on explorer browser pinned open and visible in its stacked files to the left of my chrome browser even as I don’t see the rest of it. My favorites bar in explorer also functions as a “to do” list with the un-categorized bookmarks often representing near term things I’m going to want to look into… as opposed to other types of to-do lists that I look at actively but do not want “slow burn” , but non distracting or attention calling reminders of. The key is, that by organizing my desktop.. which to me means which files and programs I have open on my desktop and where I have them dragged to and how I can reach them with a slide of my mouse… that empowers me to work without any sense of working within someone elses rules.. Previous Previous post: HP and Amazon Are Shaping Your Computing Future.